At the 1st of the month I will start a new life - I will diet more strictly, because the liberal tables of all the celebrations have added a couple of kilos to my weight; I will wake up half an hour earlier so I can have fresh, natural juice for breakfast; I will call my parents more often because they need my support; I will stop being stingy and buy that black evening dress I have dreamed about for a long time; I will compliment somebody every day and so on. Many of us promise ourselves to start something at the 1st of a month and with the beginning of the New Year. But maybe to change something in our appearances - for example, a new hair cut or colour? So if you have decided to change the latter, then I have found a couple of tools on the World Wide Web where you can model and adapt different hairstyles, cosmetics, accessories to your face. Basically, be your own stylist! 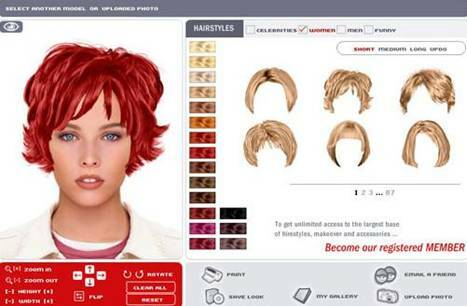 One of such websites - http://www.thehairstyler.com/ - here you can get different advice on the suitability of haircuts to one`s face, articles about the visual make-overs of Hollywood stars, assess the images and upload your own photo in the Virtual Hairstyler and try on different haircuts. The only thing is that I don`t like uploading too many of my pictures on a website. That is why I found some downloadable programmes for private use :) One I really liked - Style Advisor – Виртуальный стилист2 - simple, easy to use. The adjustable haircuts can initially be filtered by selecting only short, medium or long haircuts. Similarly, you can choose casual haircuts, haircuts for celebrations, for the cold and hot seasons. Each haircut and colour comes with variations for make-up, jewellery, accessories. Each created variation can be saved as an image to be able to select the best one afterwards.